Join us for the sixth annual “Morning of Hope” breakfast benefitting HopeWorks and the work being done in the city of Memphis. 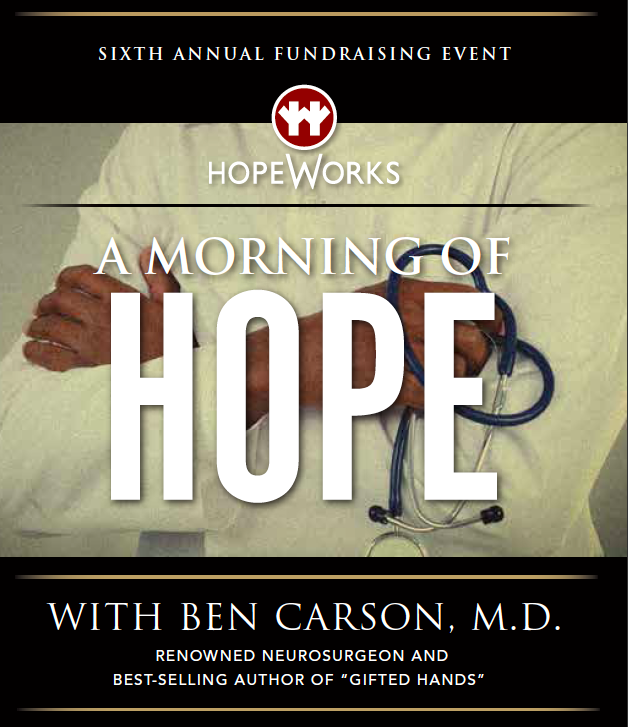 Enjoy a gourmet breakfast, musical entertainment and hear a moving message from renowned neurosurgeon Ben Carson, M.D. For more information, contact HopeWorks at (901) 272-3700 or email Ron Wade at rwade@whyhopeworks.org. Growing up, life in inner-city Detroit was not always easy for Dr. Carson and his mother and older brother. Although he had a childhood dream of becoming a physician, Dr. Carson had to persevere through dire poverty, poor grades, a horrible temper and low self-esteem. However, his mother, with only a third-grade education, challenged her sons to strive for excellence. Many HopeWorks students enter the Personal Career Development program having lived in poverty since they were young children. Others walked down the wrong path later in life. But for all, encouragement pushes them from the cycle and into a life filled with faith, hope and love. Like Dr. Carson’s hardworking mother, HopeWorks encourages individuals to improve their lives through daily classes and meals, educational training and spiritual counseling. At the forefront, encouragement from HopeWorks staff, our faith encouragers and fellow students is what instills a sense of hope in those who’ve had little for a long time. Just as God encourages us with his promises, we are led to encourage our students to persevere through their own challenges.